Two institutions work together to provide global opportunities for hospitality professionals and students. Established in 1953, American Hotel and Lodging Education Institute has been the premier source of quality hospitality education, training, and professional certification that serve the needs of hospitality schools and industries worldwide. To be AHLEI certified means that a hospitality student or practitioner has earned the ultimate distinction of professional excellence in the hospitality industry. 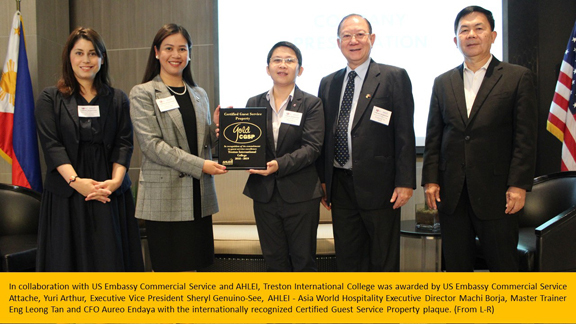 AHLEI certifies and validates competencies in conjunction with academia and industry experts for more than 20 positions in the hospitality industry through its official program provider, Asia World Hospitality. Treston International College is the first Global Academic Partner of AHLEI. In 2014, AHLEI signed a license agreement with Treston International College to offer AHLEI’s hospitality management courses and certificates. The school offers AHLEI’s 12-course Hospitality Management Diploma, as well as individual AHLEI certificates to students and professionals. Treston is one of the first schools in the Philippines to specialize in Tourism and Hospitality Management; it pioneered the Degree Program in Culinary Management. For more information, visit www.treston.edu.ph or www.asiaworldhospitality.com, or call (02) 459-7400 loc. 7411 or 729-6865.